Over the last twenty years ‘Europeanisation’ has become a key concept in European Studies, almost a research field of its own. The current meaning of the term must have been introduced around 1994 in a seminal JCMS article by Robert Ladrech (possible that there are some earlier occurrences that I am unaware of). Prior to this rather recent semantic shift, ‘Europeanisation’, both in its English and French version, was a term used mainly in the 19th century, in contexts of cultural hegemony. The Oxford English Dictionary of 1989, for instance, defines it at ‘to make European in appearance, form, habit, or mode of life’ and cites some literary quotes concerning the ‘Europeanisation’ of India, Egypt or Japan. I was therefore quite surprised to bump into it in a newspaper article dated 5 September 1955. The text in question is the report on the first football match of a pan-European club competition, known then as ‘The European Champions Clubs Cup’ and today as ‘The Champions League’. At the end of his match analysis in L’Equipe, the French sports daily who was behind the whole idea of this competition, Gabriel Hanot expressed his fear that ‘national competitions might be sacrificed to the Europeanisation of football’. Funny enough, the ‘Europeanisation of football’ has now become a serious object of study. And the fear that the Champions League might one day eclipse all other competitions and become a closed league of ‘super-clubs’ is still regularly voiced today. 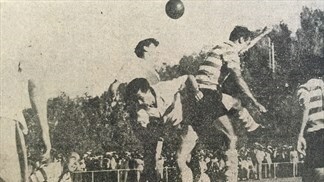 In 1955, the match between Sporting Portugal and Partizan Belgrade (final score: 3-3) was of interest to insiders only. Major media did not care at all. In comparison, the space devoted last week across all media in France, Germany, Britain or Spain, to an event as secondary as the simple draw for the first round group stage gives testimony to the degree this Europeanisation of the football horizon has reached. 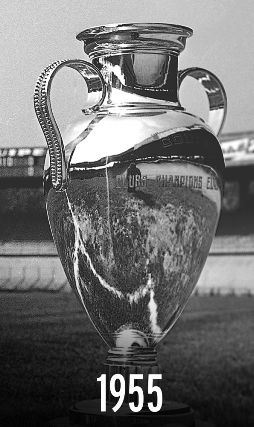 One aspect of the match in question deserves to be mentioned in particular: the fact that in its very first official game the European Cup was able to cross Cold War borders and bring together a team from the Western edge of the Continent with one from behind the Iron Curtain. Salazar’s Portugal and Tito’s Yugoslavia did not even have diplomatic relations, which complicated the travelling (the Partizan players had to insert a stop-over in Paris) but by no means prevented the match from taking place. For the Cup’s organisers, it went without saying that Central and Eastern Europe needed to be present in this new competition, and besides Partizan, teams from Budapest and Warsaw also competed (Dynamo Moscow had declined the invitation, apparently for meteorological reasons). Today we’re in a miniature Cold War again, with Russia and the EU imposing sanctions on each other. France will have to reimburse around a billion Euros to Russia for not delivering the two Mistral war ships it had already built on command of the Russian marine. But that will not keep Paris Saint-Germain from travelling to Donezk (of all places) this autumn to play their Champions League game against Chaktior, while Olympique Lyon will play Zenith Saint Petersburg. But as in 1955, football somehow manages to ignore the political circumstances. It pursues its own Europeanisation agenda, kicked off in Lisbon exactly sixty years ago. This entry was posted in Society & Culture and tagged Champions League. Bookmark the permalink.